Looks like Chucky done grown up. NBA player Andrei Kirilenko and his wife have an odd arrangement. Once a year Andrei’s wife gives him permission for a ‘free pass’ of sorts, namely he can ‘indulge’ with one groupie of his choice with her blessing. Apparently in 2022, America adopts a similar stance on crime. As long as everyone obeys the rules and toes the line for the remainder of the year, for one night per year society are allowed to blow off steam, address grudges and weed out the weak (and annoying) with zero recriminations. A few basic parameters apply. You can’t kill politicians and the like, (kinda takes the fun out of the night doesn’t it?) and once the siren that announces the commencement of festivities blows, you have only 12 hours to unleash the bloodlust and mete justice before a second siren brings an end to the Purge. Aside from that it’s kill who ya like, how ya like. The super nice, well to do Sandin family, sensibly opt out of active participation. Instead they remain in their own home, protected by an expensive high-tech security system, watching the goings on outside using several security cameras. Do some paperwork, watch some tv, get a little exercise and emerge after the second siren like so many smug groundhogs. But their bubble of selfishness is quickly burst when the (frankly stupid) young son disarms all of the security temporarily, allowing a stranger entry to the home. 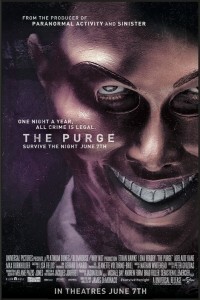 Oh you’ve gone and ruined the Purge for everyone boy. Hope you’re happy. Now go to your room! This one act brings so much unwanted attention upon the Sandins, with the final hour or so of this mercifully brief snoozer coming off like the lazy offspring of The Strangers and Assault on Precinct 13. Neither parent would be too happy with this kid. There is lots of wandering about in dark rooms yelling out the names of other family members inside, and much trying to come off like a character from Borderlands outside. The film only exists through a flawed premise. The plot trigger requires an act of stupidity. And the finale involves more than a couple predictably unpredictable twists that are as unlikely as they are unnecessary. Here is a film that will capture the attention of those seeking controversy who are willing to overlook – or are incapable of comprehending – the absence of logic that permits it to exist. I too could overlook such flaws if only the film generated some tension and / or thrills. It doesn’t do the latter, so I won’t do the former. Final Rating – 5.5 / 10. I see The Purge 2 is already in pre-production. It seems the morons have spoken.